We are are very excited to get involved in a new innovative project called Budapest Art and Design Collective. With this in mind we are joining a small community of international designers from all fields, willing to share their knowdelege to all of you interested in expressing freely and playfully your creativity. flowerMe is bringing is constantly bringing flower arrangements workshops, where you have the chance to learn basic skills on flower design. Those classes are making great gifts, self treatments or just creative fun together with your friends. 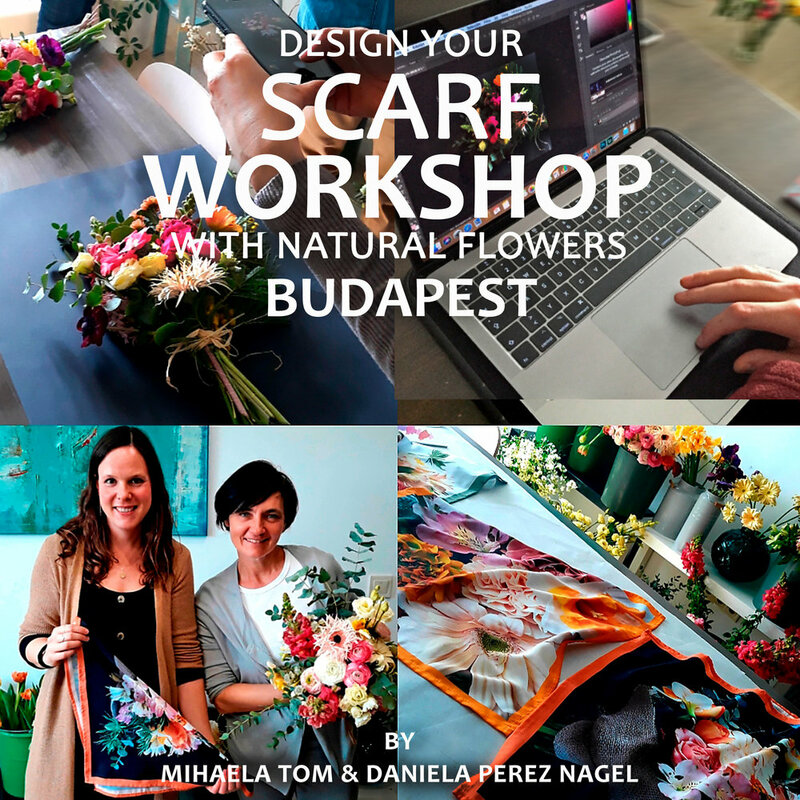 Following the great success of the last workshop, we decided to repeat this beautiful experience and invite you to learn how to do your own printed scarf on fabric with pictures of natural flowers! During the class you will pick and choose fresh flowers to craft your flower bouquet to be used as a motive for your scarf. Bring, together with the adventurous self, a sister, a mom or your best friend, and join us for an amazing creative experience! (use the copon code EARLYBIRD valid till April 20, 2019. During the 3 hours course the students learn at first how to prepare the flowers in order to guarantee their longer life in a vase, and than they are thought how to arrange them into a beautiful bouquet in order to emphasize the flowers natural, genuine beauty. Their creations are than packed nicely so they could give it as a gift or bring it home to surprise family and friends. I had the opportunity to be invited and teach the parents on how to craft a Christmas decoration door wreath at the Britannica International School in Budapest. It turned to be a creative blast morning full of good vibes and happy mothers. Further activities will be organized soon.